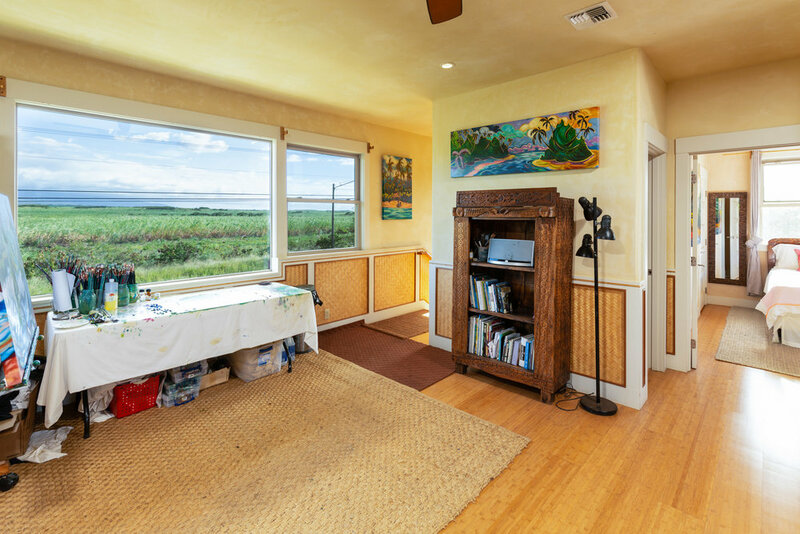 Listed by The Maui Real Estate Team, Inc.
Live in the heart of Spreckelsville. 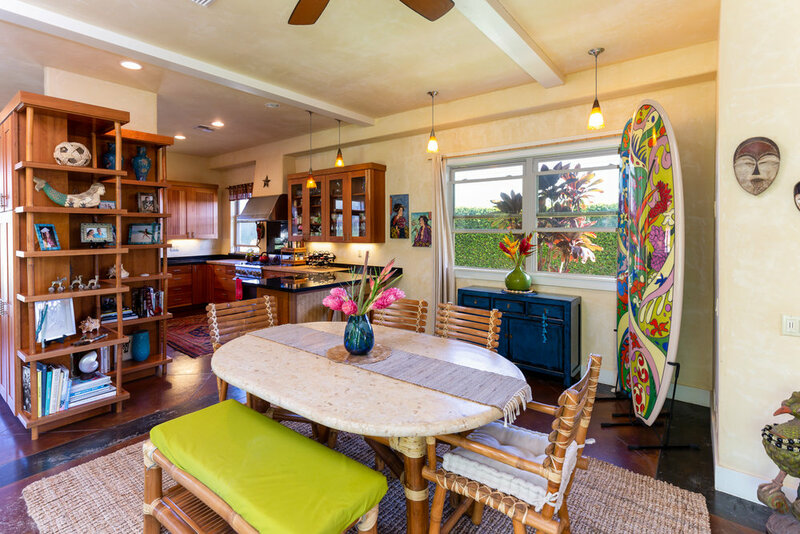 This spacious, sumptuous 3 bedroom, 3-1/2 bath home with a detached 2 car garage + storage / office area has expansive views of Haleakala. 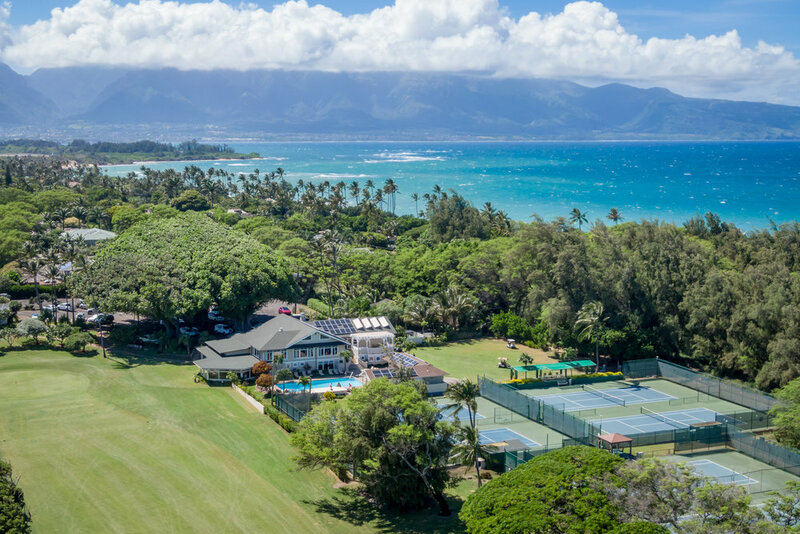 Located very close to Maui Country Club, Baby Beach and Sugar Cove means you are close to all the best outdoor activities... surfing, kitesurfing, windsurfing, SUPing, tennis, golf, beach walks or just relaxing. Spreckelsville is the ultimate location for an active lifestyle. Call us for more information or to schedule a showing! YOU ARE IN LUCK!!! Kim's designer surfboards can be placed just about anywhere. Enhance your interior with a splash of color and excitement. These hand painted surfboards are all hand shaped on Maui by local shaper, David Gott. Kim paints them in the raw foam form, then they are sent back to David for the final glassing and sanding stages. Each surfboard is a one of a kind piece you are sure to enjoy for years to come. Take a piece of Maui home with you! "Mystic Waters" Size 6'10" surfboard available to order! "Schools Out" designer surfboard in size 6'10" mixed with "Wind and Waves", a best selling print. Get yours today. Once you arrive, Kim greets you with the fresh Perrier and takes you on a guided journey, inviting you to explore her whole creative process--from contemplating the amazing view of Haleakala, the Inspirational Indian sarongs draped over the couches, the overflowing lush pallets, to the workshop where her custom surfboards come to life, one painstaking layer at a time. At the end of the journey you may want to take a piece of Maui home with you! Sharks have been a big theme in these two new boards Kim just finished! Straight out of the glassing room... Available for purchase. The holidays are right around the corner so get yours today! Hawaii's revered shark god, Kamohoali'li, was not one to be trifled with, and neither is this board. The elemental blues and greens emphasize the sleek beauty and power of the island's protector of the seas. Need Ideas on how to display your Surfboard? Click the link to a blog post we wrote to give you more ideas! 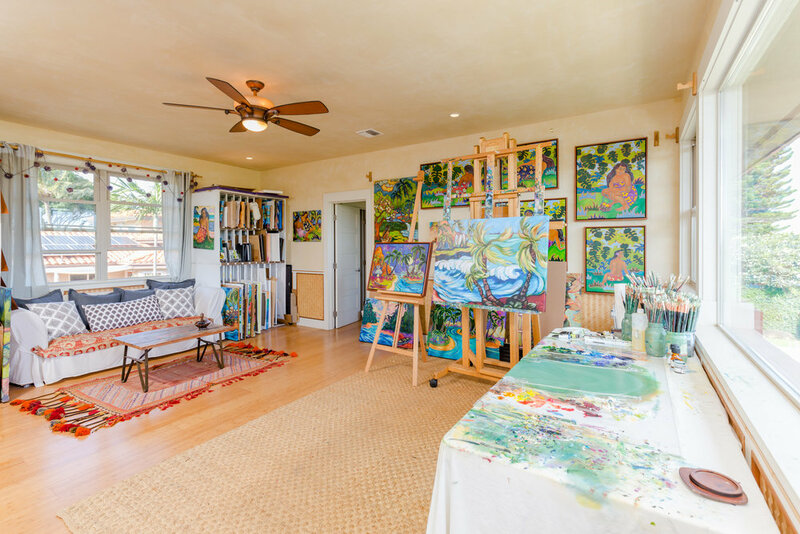 Kim McDonald has been as busy as ever painting away in her studio in Paia, Maui. See the latest creations below. She has been pulling inspiration from the native tropical flowers. All the vibrant colors come together so nicely. "Pua Power" 7'10" Longboard ~ "Pua" in Hawaiian means "flower"
"Star Light Star Bright" is an original oil painting. Kim's new series "Twilight in the Tropics" is inspired by the glow from the sky when the sun is below the horizon. Maui's magical sun being scattered across the sky as day turns into night. A Hawaiian lei can be constructed of leaves, flowers, seashells, feathers, seeds, nuts, and even bone and teeth from various animals. It is a custom that still lives on in Hawai'i today. Below is a Plumeria Lei. These flowers are some of the most fragrant, and come in a wide variety of colors. They don't last long once picked from a tree, so the time spent with them are special. A Lei can be worn at anytime for any occasion. They are a nice gesture for arriving guests, life celebrations, special occasions and holidays. There are few "rules" when it comes to wearing or giving a Lei. 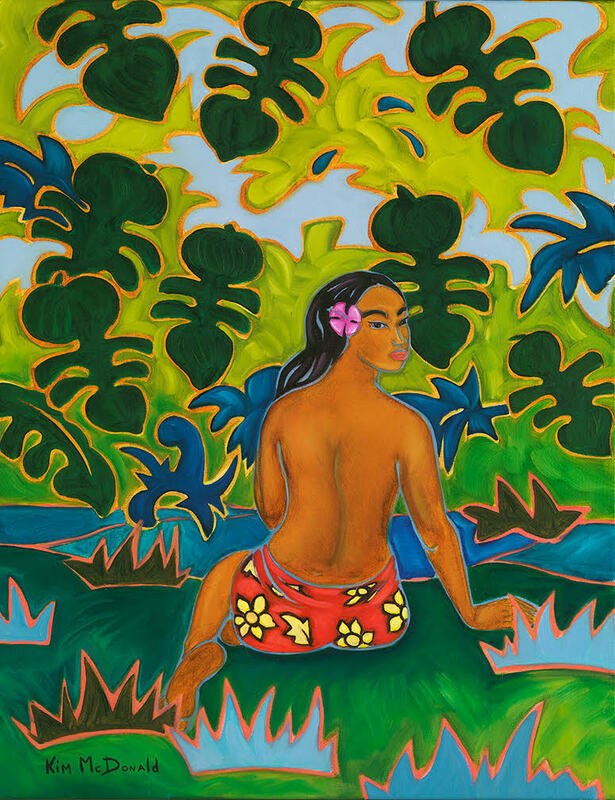 Have you ever dreamed of owning a surfboard hand painted by world renown artist Kim McDonald? Don't know where to start or where to display it? The possibilities are endless! Anything you dream can become a reality. Here are a few examples of ways they can be displayed. Acrylic vertical wall mount to display your board anywhere. Exciting NEWS! Kim McDonald's artwork is back in the Beach House Restaurant on Kauai. Within the restaurant you will find an abundance of her work. 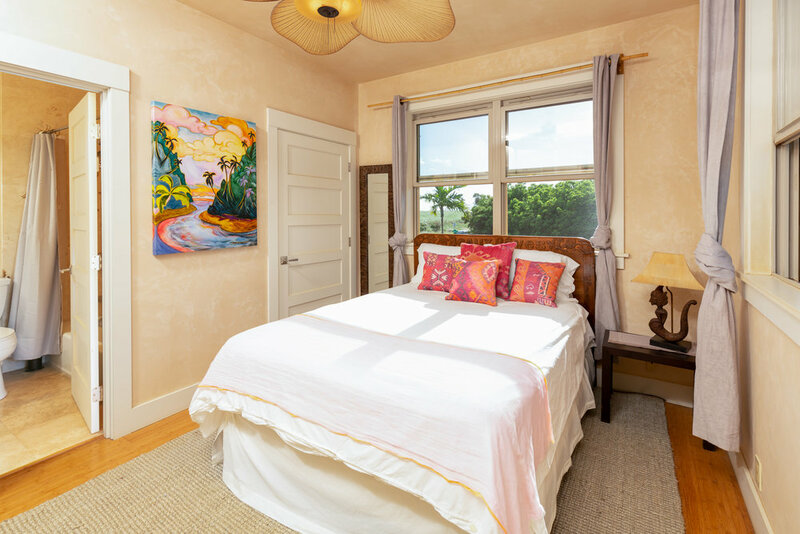 You are sure to find something you love and bring a little piece of paradise home with you. "Black Pearl Gallery" is located in the Beach House Restaurant, Poipu, Kauai. You can find her latest work there. Add to your collection or become a new collector! Maui Hands Gallery Celebrates 25 years! 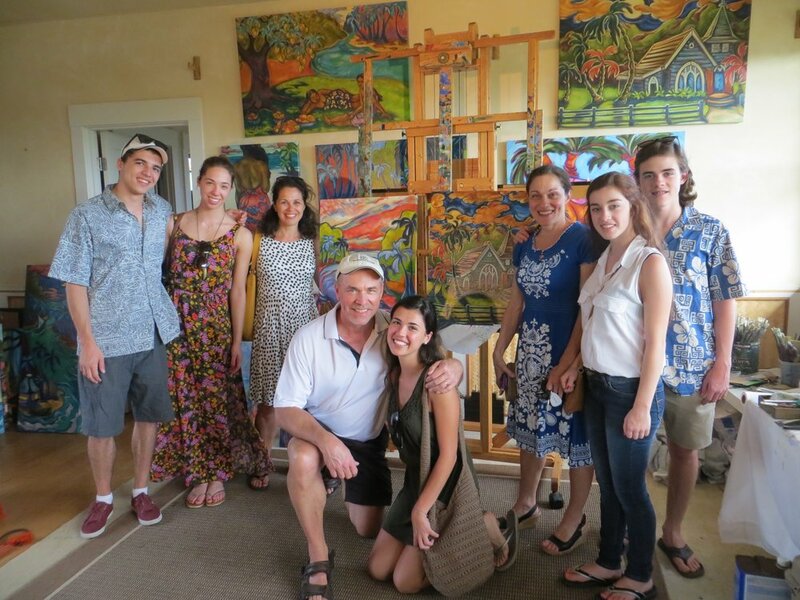 This past weekend Maui Hands Gallery celebrated their 25 year anniversary! 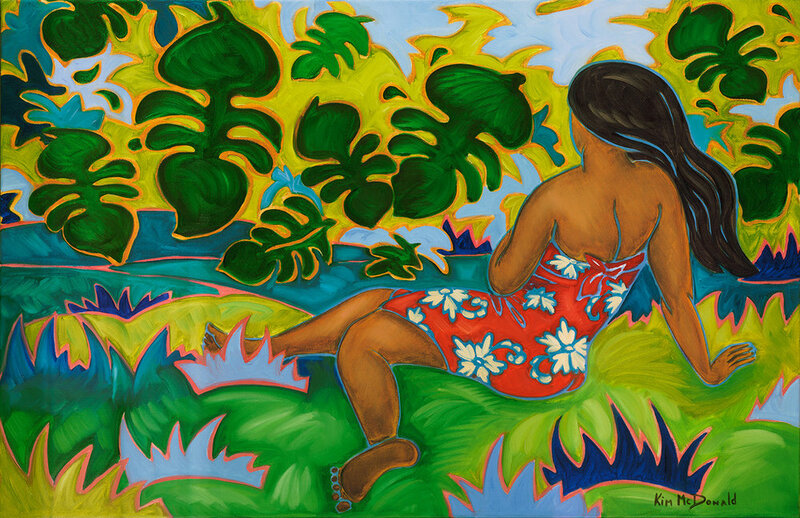 Kim McDonald has had her work featured in Maui Hands for many years. We are so thankful for the hospitality and relationships created. Cheers to another 25! Saturday I took a beautiful drive to Hana to one of my favorite representing galleries, Hana Coast Gallery. My mission was deliver all new art to freshen up the spring collection! Always a joy to see gallery Director Alesiamae (photographed below) Next time you're in Hana, be sure to stop by the Hana Coast Gallery to check out all the amazing local artists. I had the honor of painting a couple surfboards for professional waterman Kai Lenny. Photographed below is Kai with his gun board with his custom red shark I designed, this board he rode while surfing JAWS at Peahi, one of the biggest breaks in the world. Some of you may remember a few years ago when I brought my tribal surfboard art onto towels and other beach lifestyle products, starting the launch of KAIKIMBA. One of the most exciting parts of that whole new venture was the photoshoot. Seeing artists work with one another and collaborate with each other is exhilarating, and leaves you with beautiful visuals. Now I take you back to Paia Bay via 2013 with the stunningly talented Maui girl- Callie Mahoney and the absolutely brilliant photographer Peter Augustin! Enjoy! 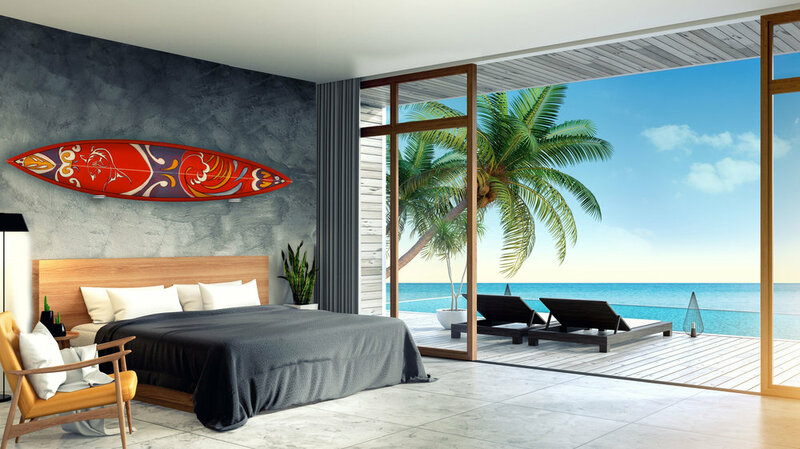 There are several ways to display a surfboard when hanging as art. I have tried several hanging techniques and props and as of the last few years my favorite stand has been these lightweight, simple and sleek V- Stands from SurfWorks USA . The owner Frank is a super nice and helpful. The prices are good and the stands are quality! SurfWorks has a variety of board stands but pictured below are the surfboard V-Stands. Check them out! Aloha everyone! I am back in one of my favorite places in the world and my second home; Aspen, Colorado. This time I brought some boards with me, surfboards that is. I am beyond thrilled to be showing my new Oceanic Series Surfboards at my favorite ski shop, Performance Ski, for the month of March! All of the surfboards are shaped and glassed by world-class shaper David Gott in Maui, Hawaii. I hand-paint each surfboard making it an original piece of art where no two are alike. These one-of-a-kind surfboards are surely a cool, fun, and sleek addition to any room. If you are in Aspen during March, stop by Performance Ski! I look forward to seeing familiar faces and meeting new ones.